UM-1EX is a simple USB MIDI interface offering one MIDI input & one MIDI output in a complete cable to connect your MIDI device directly to the computer. The UM-1EX’s MIDI Out can also function as a MIDI Thru, for use with separate input and output devices. It offers direct support for OS native drivers for Windows or Mac OS X, so that no installation disk is required. The UM-1X is useful for small MIDI studios where only one MIDI device will be connected in close proximity to the computer and is also ideal for connecting a digital instrument to a computer. 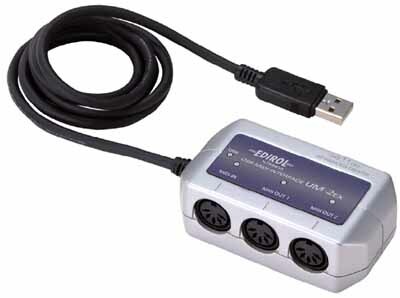 The UM-2EX is a simple USB MIDI interface offering one MIDI input & two MIDI output ports. It offers a variety of features, including FPT (Fast Processing Technology of MIDI transmission), MIDI signal indicators, support for OS-Standard drivers on the latest versions of Mac OS and Windows. The UM-2EX is well suited for any small MIDI studio application or portable MIDI station. The female MIDI jacks allow for any length of MIDI cable to be used and make the UM-2EX ideal for MIDI devices placed a good distance form the computer. The UM-3EX is tan innovative mid-sized MIDI interface . The expandable design of the UM-3EX makes it the ideal MIDI interface for a relatively small studio, but allows you to daisy-chain up to three UM-3EX’s together for a total of 9 MIDI inputs and outputs. The UM-3EX can be mounted into the RAF-70, a rack-mount kit, making for a clean, expandable studio installation. The UM-3EX allows you to select between MIDI Out and MIDI Thru for each output port. 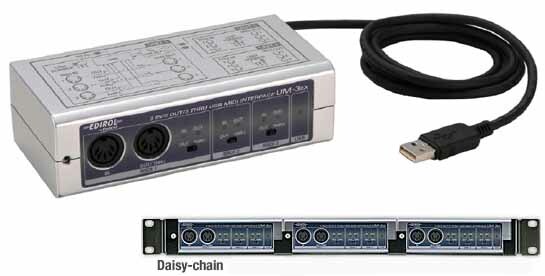 The UM-3EX uses FPT (Fast Processing Technology) to ensure low-latency, low-jitter MIDI transmission, even with three devices daisy-chained together.